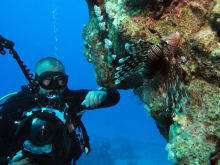 We are an enthusiastic team of dive professionals who have lived and worked in the area for many years. During our time in Amed and Tulamben, we realized that the area was missing a dive operation that offered services personalized to the individual diver or group. We are not here to be the biggest dive center, we are here to be the best. At Bali Dive Trek, we love what we do. We have a deep respect for the ocean and the rich Balinese culture. Join us as we take you on a journey through the beautiful oceans of Bali. I booked this trip for my husband. He had a blast and said the instructor was incredible. The pictures were so fun to see also, and now my husband is trying to figure out when he can get certified. The booking was very simple and I finished the whole process in just 2 minutes. It was really a great experience booking with the site, and I hope that other websites allows such fast bookings. Afterwards, our host immediately contacted us to make sure that everything is all set: He asked us at what time we would arrive and whether he could prepare anything for us when we arrived. What surprised me the most is that the owner of the place (Antoine) welcomes us personally. He was very unbelievably nice and showed us around the resort and make sure that he did not miss any details that we might need. The next day was the training day and Alexis (the instructor) was also very nice and helped us get through the day with the intense training, but somehow managed to remind us to always have fun. We did a few pool session and a number of dive on the Batu Belah dive spot, and after we got back to the resort, Antoine made sure that everything is okay and we enjoyed our dive day (which we did!). It might be too good to be true, but it's the truth. Everyone was so nice, the place is very nice and the food is really worth the value. Too bad I did not take my phone to the dive spot to take pictures. Many thanks to Voyagin and the Bali Dive Trek team who made this experience possible! My instructor Max was super friendly, attentive and patient. He made me feel comfortable, though this was all new to me. My first diving experience with Bali Dive Trek was the highlight of my trip to Bali. It was a day to remember! :) Highly recommended! When we arrived for our day experience as a group of 3, we were a little nervous and had some worries about diving. However, everyone at Bali Dive Trek was welcoming and extremely friendly. Our instructor for the day was Ary, and he was extremely patient and reassuring. Particularly when some of us struggled with some elements of the diving in the pool session. When we were all confident enough we headed to the sea. We went to the coral garden first which was great for us to get our confidence in the water up a little and practice what we learned earlier. We saw so many different types of fish it was amazing. Then after a break we went to the shipwreck. Because of the practice in the coral garden we were able to enjoy it a lot more since we didn't have to work so hard to concentrate on what we were doing. The shipwreck itself was amazing to see! We were able to swim through the cargo room and being amongst all the fish was amazing. Ary was fun and reassuring throughout the whole experience, and should I ever come back to Bali and dive again, I'll most certainly be going back to Bali Dive Trek.